KATHMANDU, Nepal (CNN) -- An unopposed former Communist leader was elected Nepal's new prime minister Saturday, ending nearly three weeks of political uncertainty. 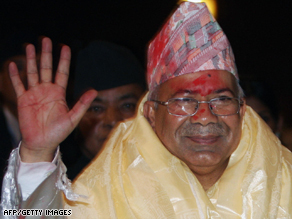 Madhav Kumar Nepal waves at his supporters at the country's parliament in Kathmandu. Madhav Kumar Nepal of the Communist Party of Nepal (Unified Marxist-Leninist) was the only person to serve as a candidate for the post after he received backing from more than 20 of the 25 parties in parliament. Nepal, 56, is a former general secretary of the Communist Party, but had resigned after the party made a poor showing last year against another Communist movement. In that vote, the Communist Party of Nepal (Maoist) became the largest party, with 38 percent of the seats in the 601-member constituent assembly which also functions as parliament. Nepal had been general secretary since 1993 and served as the country's deputy prime minister for nine months in 1995. Pushpa Kamal Dahal, the Maoist chairman, resigned as prime minister May 4 after the president overturned the Cabinet's decision to sack the army chief. Nepal became a republic last year. The new government has two important tasks before it: the writing of a new constitution within a year, and integration of 19,600 Maoist combatants into the security forces. Without the support of the former Maoist rebels, these tasks cannot be achieved. The Maoists fought a 10-year insurgency aimed at abolishing the monarchy.